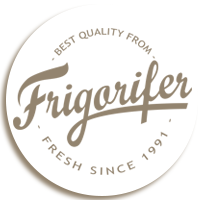 Since 1991, a significant part of the frozen food deliveries to the Romanian, Moldovan and Ukrainian markets has been made through Frigorifer’s Bonded Warehouse facility. With a strategic location on the Danube, the company’s role as importer and exporter has always been easier and faster. Becoming a huge refrigerator for a major part of Eastern Europe is underpinned by years of hard work, expertise and commitment to offering professional logistic and storage services. Frigorifer is able to logistically operate frozen goods through 3 basic modes of transportation: road, railway and naval. Since numbers count greatest; below is a small idea of the scale of our storage capacity. – A frozen capacity amounts to 16000 pallets. – The frozen goods are stored in modern rooms, equipped with drive-in storage systems, at controlled temperatures ranging from +5˚ to -22˚ Celsius. – Our cutting-edge refrigeration plant uses high-tech, environmentally-friendly ammonia compressors. – We have our own berth for ships up to 5,000 t.